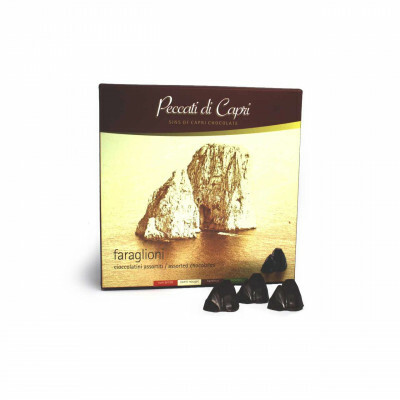 Package 20x20 (photograph Faraglioni) with 16 small Faraglioni (10g each). With 4 flavors (4 with rum brittle cream, 4 with sweet nougat cream, 4 with hazelnut cream, 4 with pistachio cream). CHOCOLATE OUTER LAYER: dark chocolate (cocoa mass, sugar, cocoa butter, emulsifier: Soya lecithin, natural vanilla aroma). 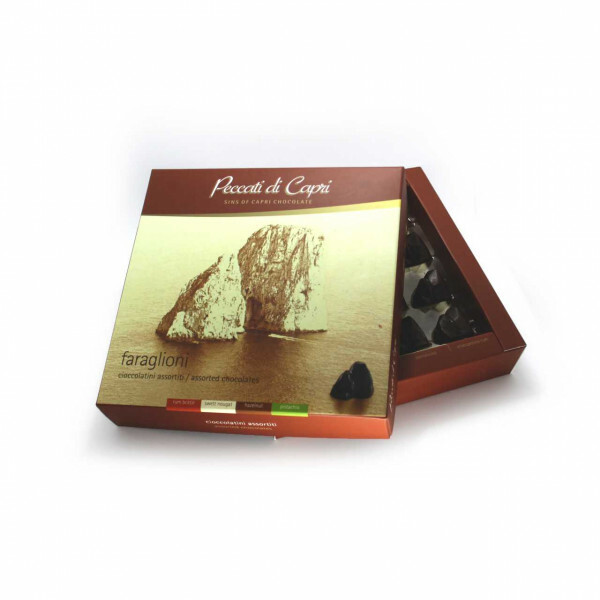 RUM BRITTLE: sugar, Hazelnut, smikked milk powder, brittle mass (hazelnut, sugar, palm oil, aromas), rum, crunchy crumb, Lactose, glucosium, emulsifier:soya lecithin.SWEET NOUGAT: sugar, Hazelnut, smikked milk powder, brittle mass (hazelnut, sugar, palm oil, aromas), crunchy crumb, Lactose, glucosium, emulsifier:soya lecithin. HAZELNUT: Hazelnut 12%, vegetable fats (palm, sunflower, shea, canola) in variable proportions, chocolate powder, skimmed milk powder, lactose, emulsifier: soya lecithin, aromas. PISTACHIO: sugar, skimmed milk powder, white chocolate ( sugar, whole milk powder, cocoa butter, natural vanilla aroma, emulsifier: soya lecithin), pistachio mass ( sugar, hazelnut, pistahio 25%, sunflower oil, aromas, emulsifier: soya lecithin, W131 colour).